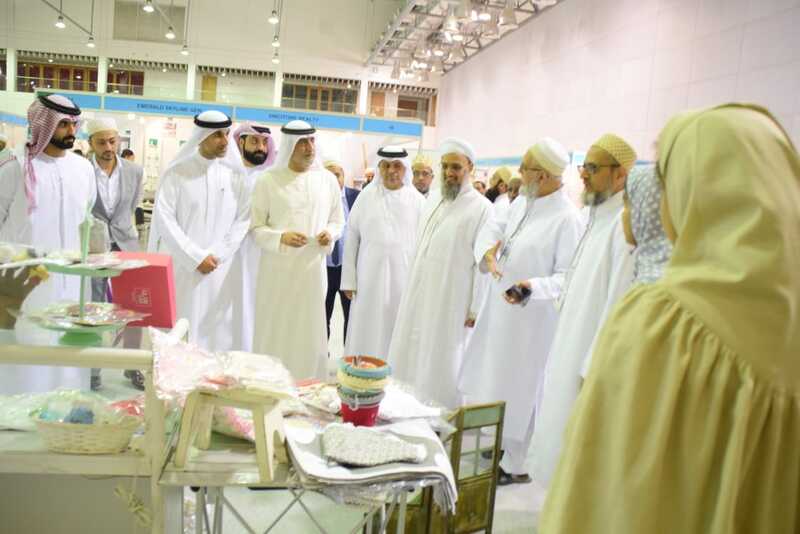 Organised and managed by Anjuman Najmi S. C., Sharjah, the three-day Dawoodi Bohra Trade Expo 2019 will continue until January 19 (Saturday). The Dawoodi Bohra Trade Expo was inaugurated by Sheikh Abdulrahman bin Salem Al Qasimi, in the presence of Shri Vipul, the Consul General of India; His Excellency Mohamed Ahmed Amin, Acting Director-General of the Sharjah Chamber of Commerce and Industry (SCCI); and His Excellency Saif Mohamed Al Midfa, CEO of Expo Centre Sharjah. The inauguration was also attended by a number of officials from the Consulate, as well as businesspeople, investors, and members of the Indian community residing in the country. ‘With their sharp eye for business, Dawoodi Bohras across the world are well recognized as a business community with emphasis on Islamic business ethics that include doing fair and halal business. The Dawoodi Bohra Trade Expo 2019 is a manifestation of these principles that inspire entrepreneurs to develop and redefine their business,’ said Shabbir bhai saheb, President, Anjuman Najmi S. C.
The Dawoodi Bohras maintain an excellent record with the business community be it locally or internationally. They are synonymous with following fair trade practices and encouraging younger generations to be business minded, as emphasised by their spiritual leader Dr Syedna Mufaddal Saifuddin. ‘Aiming to provide key insights and improve business performance, the exhibition will also feature seminars from industry experts on topics such as business effectiveness, digital marketing, making your business fraud proof, information security risk, UAE labour law, credit control and more.’ said Kinana bhai saheb, Syedna’s representative in UAE . ‘This expo is a stepping stone for those wishing to showcase their economic success, as well as the entrepreneurs and aspirants who would like to establish their startups,’ he added. Being relevant in today’s marketplace is important for surviving in an extremely competitive global business environment. From January 17-19, 2019, trade professionals from a range of industries across the UAE will network and redefine businesses at the Dawoodi Bohra Trade Expo held at the Sharjah Expo Centre. The Sharjah Expo Centre provides the perfect venue for this three day expo. Here, vendors and manufacturers from all over the UAE and beyond shall have a great opportunity to showcase and feature their existing and new product range, brands and services in front of a concentrated audience. Exhibitors from across a section of industries will use this platform to demonstrate their new and innovative products, offer invaluable insight and relevant industry expertise. The show aims at attracting high quality trade visitors, professionals and guests with decision making capabilities. Local Emirati business leaders, renowned professionals and CEO’s of big business houses will be attending the three day event. For trade visitors, this show will be a great place to meet other entrepreneurs who are producing complementary products and similar services. Creating a synergy for potential partnerships and strategic alliances, thus becoming the perfect networking platform for professionals to create commercial associations and establish new contacts. The Dawoodi Bohras have been trading in the UAE from as early as the 1960’s. This country has offered great potential for trade, business and manufacturing opportunities. “The community’s flourishing businesses are a testimonial to the liberal trade environment provided by the visionary leadership of the country’s Leaders” says Dr. Mustafa Taher from the organizing committee of the Dawoodi Bohra Trade Expo. UAE is one of the most rapidly growing economies of the world and it has therefore contributed greatly to the numerous success stories of this close knit flourishing business community. In a statement given by the ANSC President, Shabbir Zainuddin, said: The Dawoodi Bohra Trade Expo is expected to attract a number of traders and professionals from across the world to attend. The high growth opportunity that UAE has consistently provided over the past decades, obviously makes it a very attractive marketplace where businesses have a conducive environment for continuous innovation and progress.